After a quick weekend in California for some swift water rescue training and a few coasters I jumped on a plane and headed to the East Coast to attend my first ever event with a club I belong to, the American Coaster Enthusiasts. They were holding their annual Preservation Conference at three parks, Alabama Splash Adventure, Lake Winnie and Six Flags Over Georgia. 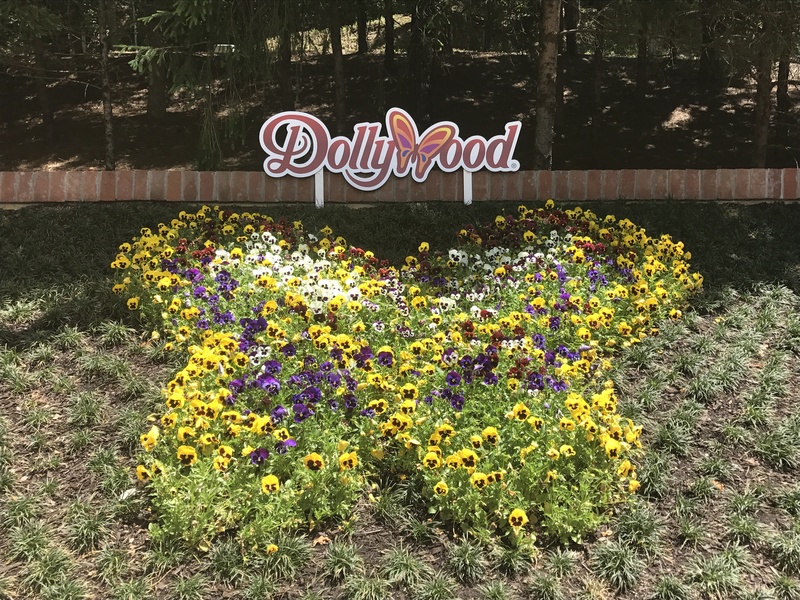 The event would take place over three days but since I had some time on my hands I thought I would visit Dollywood in Pigeon Forge, Tennessee. I arrived late to Atlanta and got a hotel room in the bad part of town. I was quick to check in outside through one of those security windows unknowing if the shady looking clerk was going to swipe my credit card number and rack up a couple thousand bucks on Amazon while I slept. The next morning I jumped in the rental car and headed up toward Tennessee on my way to Dollywood which is outside of Knoxville for those that need a landmark. It is about a four hour drive but the morning commute traffic in Atlanta added at least an hour to that. It was almost 2 pm when arrived. It was hot, dang hot. I thought my weekend in Cali was hot but it was nothing like this. It’s the humidity as everyone will tell you. As soon as I entered the park I made a beeline for a lemonade and met a couple new friends I met through Facebook. I know its weird meeting up with folks you meet online, but hey they weren’t creepy, they were an old couple from around these parts. Its always interesting to go to a theme park as a group of three. Someone is always the odd man out, the third wheel if you will. On this trip it was me. My friends were nice but for some reason they didn’t say too much and didn’t ride that many coasters. Maybe they just needed an excuse to visit the park. As soon as we met we rushed over to Lightning Rod. If anyone knows anything about roller coasters, and Lightning Rod in particular, you have to ride this one if you get a chance. Why? Not only is it awesome but since opening last year it has been plagued with problems and is closed way more often than it is running. We were extremely lucky. In fact I think we were the last group to ride it that day because when we returned to the station the ride was closed! I mentioned in my ACE profile that Lightning Rod was the coaster that was most sought after by me. I am glad I was able to check it off my list. Here are my thoughts. First, wow! This is unlike anything I have ever rode before. It is a first of its kind hybrid launch coaster built by the folks at Rocky Mountain Construction. 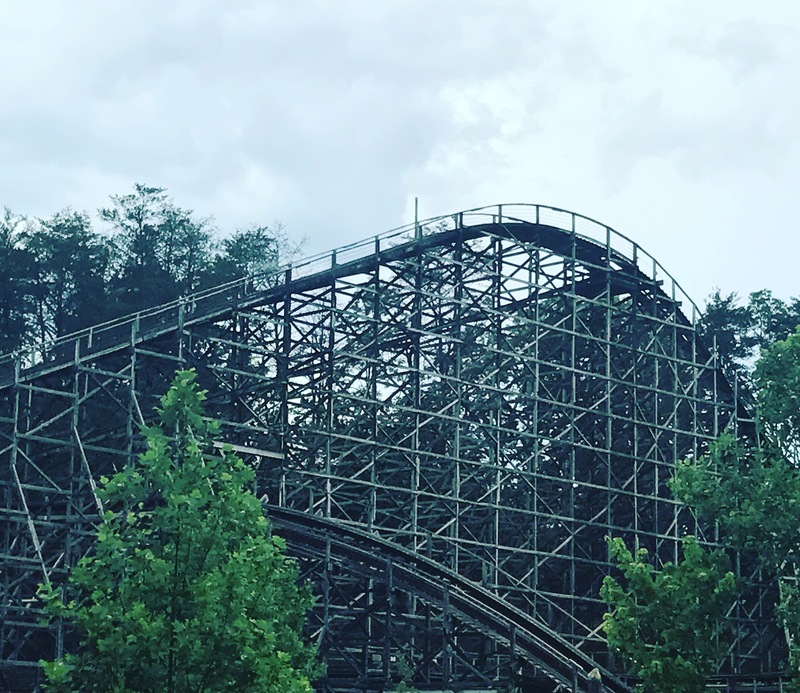 These guys have become the coaster kings over the last few years with their design and limit-pushing coasters that are unlike the the steel and woodies that most people are used to. Themed to remind riders of old school hot rods, Lightning Rod launches you from 0 to 45 mph and more than 20 stories in the air in the first few seconds where you experience the ride’s first bit of airtime. You then race on about a half mile of track at a top speed of 73 miles per hour. It is dubbed the fastest woodie in the world. This is by far one of my favorite coasters in the country. Sure there are plenty of launch coasters, but this one is different because it’s a wooden coaster. Most people are used to the clack-clack-clack as you make your way up the hill. Not on this one. On this ride you shoot off the starting line just like you would in one of those old school cool hot rods. After this ride we got a chance to really experience the park. Dollywood, named after, you guessed it, the country music legend Dolly Parton, is beautiful. Near the entrance to Lightning Rod you can take a tour of Dolly’s own tour bus, catch a live country music show or grab a snack on some of its totally delicious cinnamon bread. The park is nestled in the foothills of the Smokey Mountains and it is quite large. Most of the coasters in mixed among the trees and gives the riders an experience of mystery. 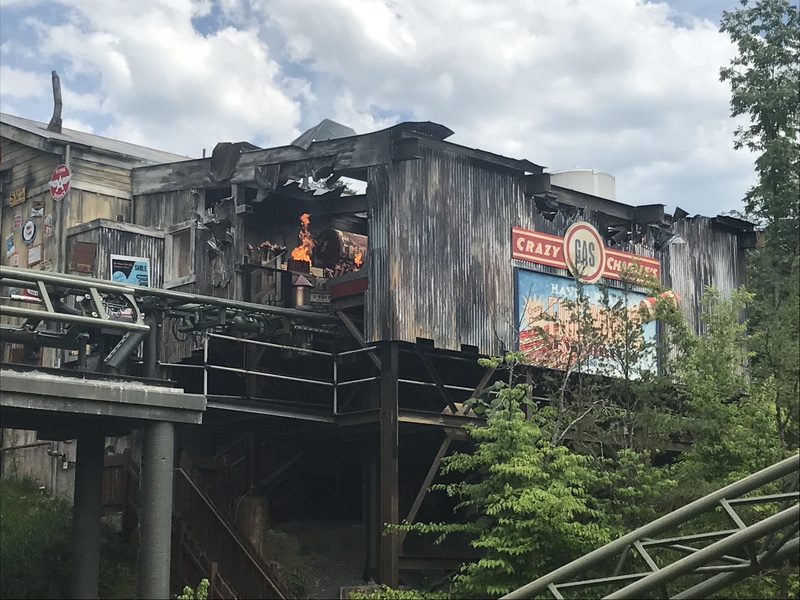 I don’t know if it was because we were here mid-week or because of it being a Dollywood thing but throughout the day a lot of the coasters were open or closed a random times. I don’t know if it was mechanical or something else. We did mange to ride all of the coasters and next up was Wild Eagle. Wild Eagle is the first winged coaster in the country. It is perched 21 stories above the park and it really does feel like you are soaring like a bird. After this one I rode one of my favorites of the day, Firechaser Express. Did you know that the fellas from the History Channel show, American Pickers found a lot of the items for this coaster’s theming and approved by Dolly herself? The ride is just plain cool. It is designed around a fireman theme and it is unlike most coasters. It starts you off going rather quickly forward then ends inside of a burning building, replete with fire and everything. Soon you are shooting down the track backwards to the station. It is a coaster that is fun for the whole family. In fact I gave up the front seat to a little boy and his dad. It was the little boy’s first time ever on a roller coaster. I think he is hooked for life after riding this one. Next up was Mystery Mine. I had to wait in line a long time for this one but it was so worth it. I had never been on a coaster like this one and it was one that I am going to remember for a long time. It travels mostly in the dark in what is themed to be an abandoned coal mine. 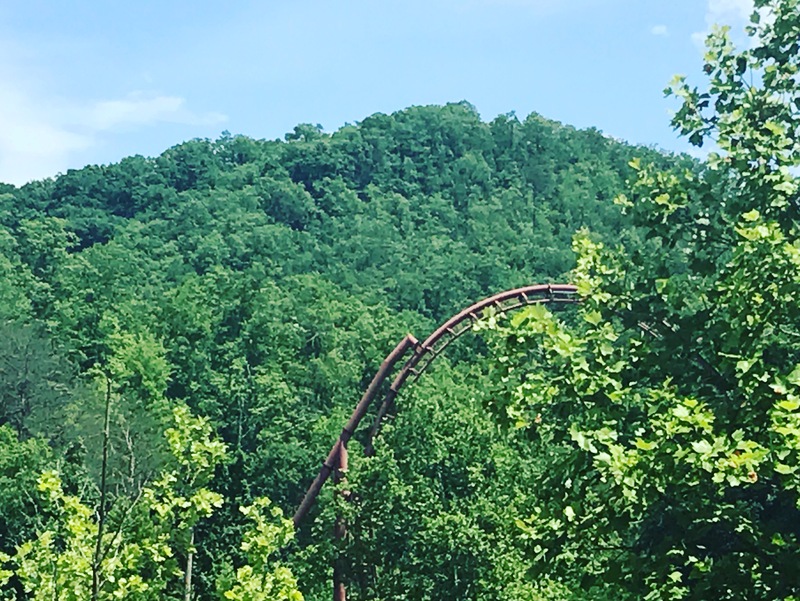 What makes this coaster so unique is that it has a couple hair raising 95 degree, 85-foot drops that plunge you into darkness but to get to the top before the drop you are literally going straight up on a vertical track! Next was a woodie that will rock and rattle your bones. It was Thunderhead. Oh my goodness. This one will take your breath away. It is dubbed as “the wildest ride in the woods” and it is. It takes riders on a 100 foot drop with speeds up to 55 mph but with its twists and turns it feels much faster. 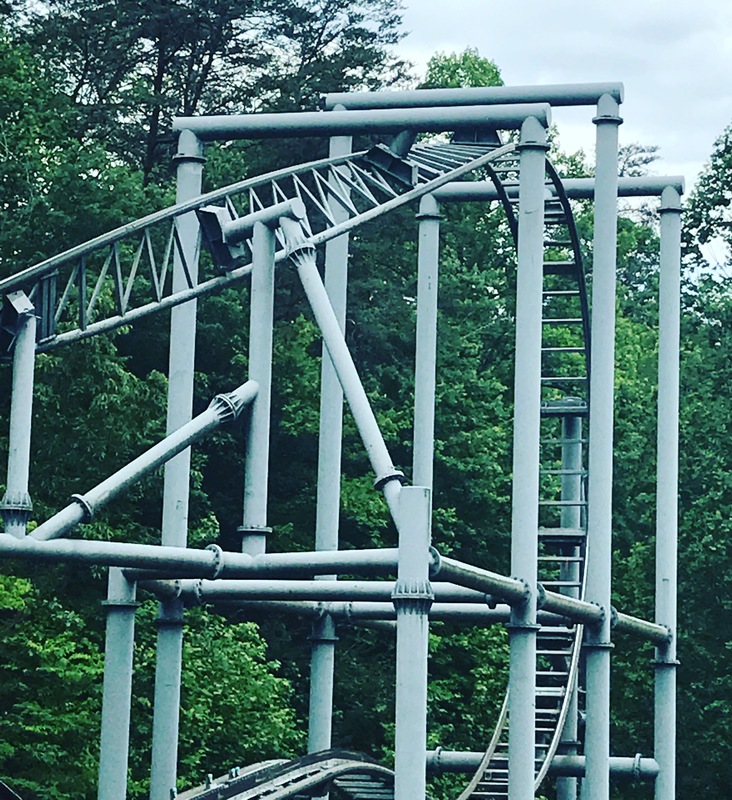 The Tennessee Tornado was the last coaster of the day. It is an old school Arrow (design) that Michele and I just learned about the week before in a documentary. It rattles and shakes you around a tripe spiral looping track at more than 70 mph. Michele calls these ‘concussion rides’ because the older style train car designs have you smacking your head on the sides of the restraints. Not fun. My new friends and I grabbed a quick burger at one of the restaurants and I hit the road. I had a three hour drive to Chattanooga before heading down to Alabama in the morning to start the Preservation Conference with ACE. I can’t wait!